A: No.Okay, maybe that's a slight exaggeration. For those of you who don't know, before I switched to the freelance writing career that better suits my desire to play video games until 4 AM on a weeknight if I damn well please lifestyle choices, I worked at a comic book store for six long years. I started out processing back issues and managed to work my way up to working the register and managing the comics. For a lot of comics fans -- especially slackers in their early 20s with designs on a writing career -- working at a shop seems like a dream job, and in a lot of ways, I suppose it is. It's certainly a common starting place for a lot of people on all sides of the industry; Matt Fraction, Colleen Coover and even our own Laura Hudson have spent time behind the counter at one point or another. I think it was Matt Wilson who said that it's like filmmakers who worked in video stores (you know, back when there were video stores), in that people do it just so that they can be around something that they love. But at the same time, it's still a retail job like any other, and it has all the hassles that go along with that, plus a handful that are unique to this particular industry. And the biggest one of those that comes to mind is Diamond Comics Distributors, the company that holds an uncontested monopoly on getting comics from the publishers to the stores. In the six years that I worked at the store, there were two, maybe three weeks that everything we'd ordered actually arrived. There were always at least one or two comics that were missing copies, and sometimes entire books that didn't ship, leaving us to report the shortages and hope that we'd get them in about three weeks, which we were able to about half the time. And these were best-case scenarios. Once, I heard from a friend who worked at a store up in Canada that they'd gotten their copies of Comic Foundry, the short-lived magazine -- also edited by Laura, along with Wired Art Director Tim Leong -- that in a lot of ways was ComicsAlliance's predecessor, a few weeks before. Our shop, meanwhile, hadn't gotten the copies we'd ordered, so I checked the reorder system, found that they were available, and had them shipped out as reorders. They arrived the next week as usual. I figured that I must've forgotten to actually enter them when I did the order, but three weeks after that, our initial order finally showed up, shipped from the same warehouse as the others. There's no way that makes any kind of sense. Then there was a week when I got a box that could fit two six-inch tall stacks of comics side-by-side that had exactly one comic in it, which meant that it cost more to have that one comic shipped to us than we could make by selling it. There was a time they shipped 200 extra copies of Justice League, but shorted us completely on two other books, including Civil War #5, which was kind of a big deal at the time. And, my personal favorite, there was the time we got a box that someone had packed full of comics and either dumped or spilled a full cup of coffee into, then taped it up and sent it out via UPS. These were not isolated incidents, either. I've heard similar stories (and worse) from people who staffed other shops across the country. Ask your local retailer next time you see him, and see if he doesn't get the ol' Comics Retail Twitch in his left eye. It's entirely possible that they've gotten better in the time since I left -- those three perfect orders were all during my last year -- but for a while there, they sure knew how to keep Wednesday mornings interesting. "I've got some old comics" meant that comics from the early '90s. "REAL old comics, man" meant 1991 specifically. "I've got the first Superman" meant they were lying. In the time I worked at the store, I dealt with countless people who unfortunately thought that a polybagged copy of Superman #75 would be their retirement fund, but a few stick out pretty clearly. I had one guy telling me he had some really old X-Men comics from when they first came out, and when I asked him if they were the original Lee/Kirby issues, he told me "Yeah, Lee Kirby, that's him." I had to explain to people on multiple occasions that we had to buy comics for less than we sold them because that was, in fact, how capitalism worked. The best one, though, was when a guy called up telling me that he had a comic that was "even more valuable than Superman #1." 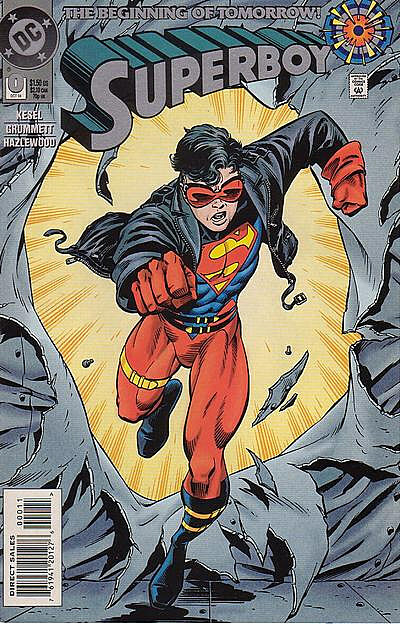 Superboy #0. See, because 0 is less than 1 and he had to be a boy before he was a man, so it must be an older comic, and therefore be more valuable. It's actually pretty logical when you think about it. And then there were the nuts and bolts of retail, like trying to figure out how to stock products for a clientele of die-hard super-hero readers for whom "indie" means "Image" (or, more accurately, "The Walking Dead"), while still trying to support more offbeat books at the retail level. I'll cop to being primarily a super-hero fan, but it was still tough watching books that I loved and wanted to see succeed gather dust on the shelves until they eventually got the axe, even when I did my best to hand-sell them. Also, I had a dream last week where I hadn't gotten the order in on time and woke up in a cold sweat trying to remember my Diamond rep's phone number, and I haven't worked there almost two years. It's traumatic, y'all. In short -- too late, I know -- there were a lot of frustrations involved in the job that I was more than happy to leave behind when I quit. But to say that there's nothing I miss is probably taking it a little too far. For one thing, there's the people. I made a lot of friends while I was there. Chad Bowers, my co-writer at Awesome Hospital and an upcoming graphic novel, was the guy who hired me to work at the shop, and there were plenty of other people I met as both customers and coworkers that I consider my pals. 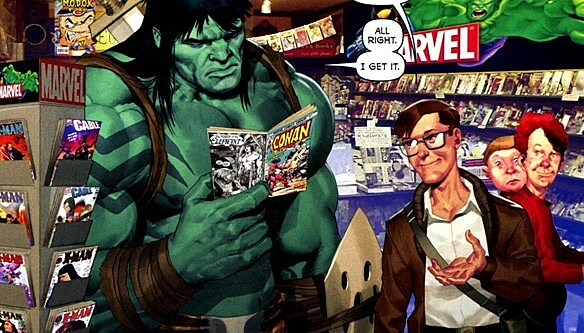 Comic book stores -- and comic book fans -- are unique in that way, in that they're so specialized that you can't help but meet people who share your interests. I still see them, of course, but not with the regularity that I used to. 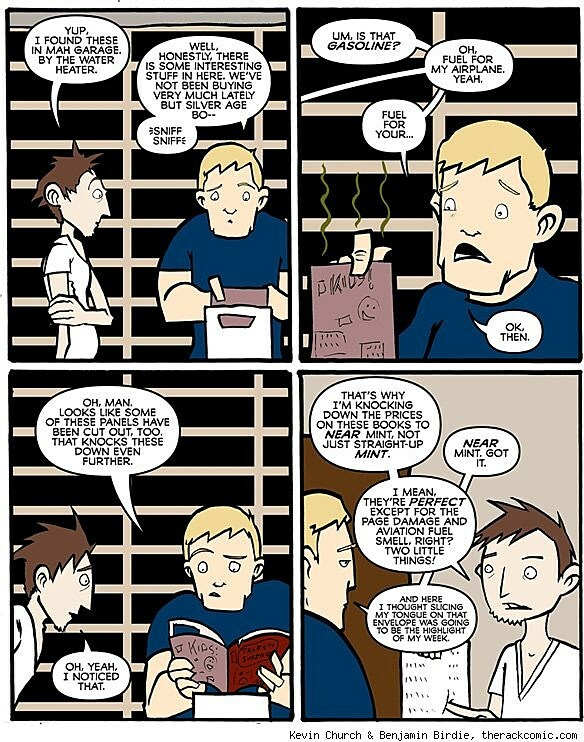 I also miss the sheer amount of comics I had access to at any given time. I've got a pretty good amount myself, but the shop was one of the largest in the country, with literally hundreds of long boxes packed with back issues. I've mentioned before that I was able to put together an entire 300-comic run of Punisher comics with no trouble, because they were all right there in the same room where I spent eight hours a day, and there were plenty of other great oddities hiding in those boxes as well. More than that, though, is the fact that I had time to read them. I read all those Punisher comics while I was on the clock because I was a terrible employee because it was the sort of job with a lot of downtime and literally thousands of things to read to stay occupied. This very column is based on the premise that I've got a pretty solid base of knowledge about comics, and 90% of it was built leaning against the counter, flipping through back issues and grabbing trades off the wall to kill time. And it's because I spent that much time around comics that I started writing about them, which led directly to working for ComicsAlliance. These days, though -- and I fully realize that this is going to sound like the whiniest complaint ever -- I just don't have that kind of time. I'm actually not caught up with some current books that I really love because I'm constantly reading things with an eye on stuff that I can write about instead. Don't get me wrong -- I love my job, and as the sheer number of words I've written about Batman prove, ComicsAlliance allows me to pretty much write about stuff that I'm already interested in anyway -- except when, you know, the cruel demands of my editors must be met. Still, I can't imagine reading straight through 300 issues of Punisher or 12 Archives' worth of Legion of Super-Heroes (another comic I read through in one obsessive burst) because I wouldn't be able to write an entertaining column about the same comics every day for a month. It's really the only downside of what I do now -- and an almost infinitesimally tiny one at that -- in that the thing I do for fun is also the thing that I have to do for work. It blurs the lines a little bit, in a way that just selling them didn't. But on the other hand, I can do the job I have now without ever putting on pants, and that's a pretty crucial advantage. And now, a few quick answers for The Lightning Round! 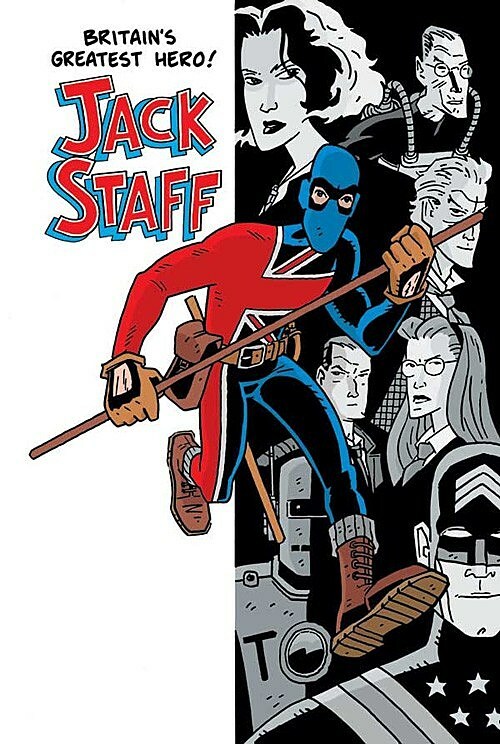 A: Paul Grist's Jack Staff. Quite possibly my favorite comic book ever. A: I'm a pretty big pro wrestling fan, but it's slightly less well known that I'm extremely passionate about fine cheeses. One of these days someone's going to ask whether Batman prefers triple-cream Brie, extra-sharp Cheddar or applewood smoked Gouda, and you guys are going to get the 4,000-word essay that nobody wants to read. A: As other people pointed out on Twitter, it's unquestionably Bill Sienkiewicz. I had a poster autographed by that guy for three years (a promo for the Sci-Fi Channel's Good vs. Evil that I won in a Wizard contest, of all things) before I knew that it was Sin-KEV-itch and not SINE-Ke-wicks. I've always thought it would be a great idea for a website to have a directory of how to pronounce creator names like "Fabian Nicieza" and "Kurt Busiek," along with character names like Ra's al-Ghul and Darkseid , since you very rarely hear them spoken aloud and usually only see them written. But as the rest of this column has proven, I am fundamentally a very lazy man.